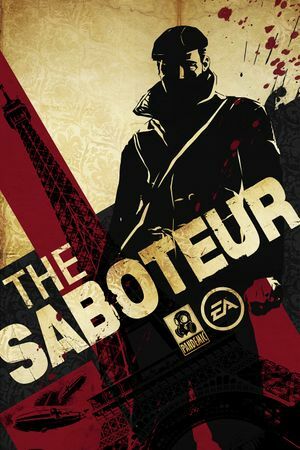 Not to be confused with Saboteur!. 7.6 "The Saboteur is unable to continue due to an error initializing your graphics hardware." SecuROM PA DRM, limited to five activations per machine. This causes low fps (30-40fps) issue. The latest version is Patch 1.03b. This patch may slightly improve any performance issues on ATI/AMD cards. Allows the game to use more than 2 GB of RAM (already enabled in the GOG.com version, you do not have to patch it). Nvidia users can enable SGSSAA by following this guide. Double Buffered V-sync enabled by default. See Vertical sync (Vsync). Add Windowed 1 at the end of the file. Change VSync 1 to Vsync 0 to disable V-sync. Change PostProcessing 1 to PostProcessing 0. Edit InputTemplates.txt in the installation folder and in the configuration file(s) location. At the end of the DEFAULT section, change the following settings to YES/NO. Disable the game's shadows in the options menu. Right-click on the launcher (or desktop icon). Set the compatibility to Windows XP (Service Pack 2) or Windows XP (Service Pack 3). On Windows setting the game's priority through the task manager to Real Time might help. Running the game with less cores will only end up with the game running even more poorly. Fixed in the GOG.com release. (May not work for other resolutions than 16:9). The fix is now finally working in Wine on Linux (tested with 1920x1200). Install older drivers versions for Windows Vista and 7 (64-bit), Windows Vista and 7 (32-bit) or Windows XP. No need to uninstall current drivers, they can be simply overridden. Limited fix only up to the GTX 400 series. 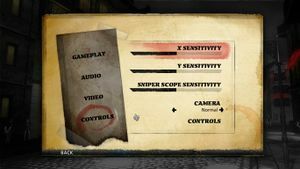 Set the game's resolution to 720p or lower. 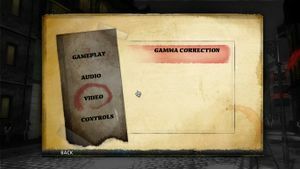 The resolution will not be taken into account if the refresh rate is set higher than 60 Hz in the launcher. 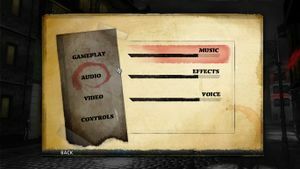 For running the game at higher than 60 Hz properly, see Run the game at screen refresh rate. Open VideoSetup.exe in the installation folder. Set refresh rate to 60 Hz or less. Open <path-to-game>\d3d9.ini or %USERPROFILE%\Documents\My Mods\SpecialK\Profiles\Saboteur.exe\SpecialK.ini depending on the installation method you used. "The Saboteur is unable to continue due to an error initializing your graphics hardware." 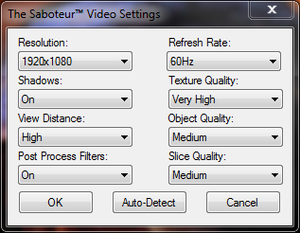 Download The Saboteur - Controller Remapping Fix. Copy the file to the installation folder and overwrite. Alternatively, go to the installation folder, open InputTemplates.txt and remove alternative pad then save. Look for a section called OTHER GAMEPAD. Change SOLDIER_TURN_LEFT from JOYSTICK_STICK2_LEFT to INPUT_NONE. Change SOLDIER_TURN_RIGHT from JOYSTICK_STICK2_RIGHT to INPUT_NONE. Repeat this process for InputTemplates.txt.